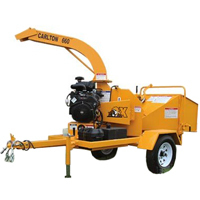 The Carlton 660 Wood Chipper is the perfect choice when a powerful, ultra-compact machine is needed. The 660’s compact size and weight allow it to be maneuvered right to the work site. The unit’s powerful feed system and 30 horsepower engine provide the muscle to get the job done. The compact J.P. Carlton 660 is designed and built to go out and chip everyday. 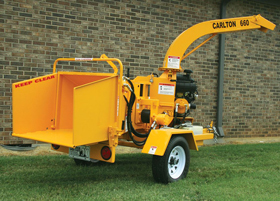 The design, features and heavy duty construction of the J.P. Carlton 660 make it the ideal chipper for a rental fleet. Ultra Compact Size- The 660 can be towed by compact trucks and sport utility vehicles. Simple Operation- Users can be trained in a matter of minutes. 2″ Ball Coupler with Coiled Safety Cables- Makes hook up quick and easy. Full Size 14″ Tires and 2000-Pound Axle- Minimize road damage and allow highway speeds. Spare tires are inexpensive and readily available. Digital Autofeed- Controls the feed based on engine speed, helping to prevent overfeeding. Large Folding Infeed Table- Distances the operator from the feed wheel. Double Edged Knives- Easily flipped to provide a second cutting edge when needed. Low Initial Investment & Maintenance Costs- Allows for extremely competitive rental rates. Superior Performance- Keeps the customers coming back.